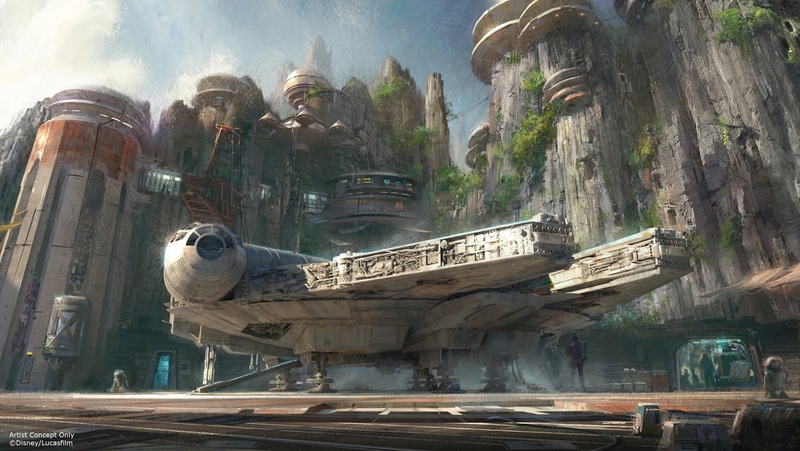 The long awaited "Star Wars Land" at Disney theme parks is finally becoming a reality and it looks as though we are about to learn more details about the upcoming attraction from none other than Han Solo himself. Entertainment Weekly is reporting that a Television special titled The Wonderful World of Disney is set to air on February 21st on ABC and Harrison Ford will appear to reveal at least some of Disney's plans for the 14-acre areas at both Walt Disney World in Orlando, Florida and Disneyland in Anaheim, California. Other stars including Josh Gad, Witney Carson and Elton John will also be appearing in the special. Could we be getting our first looks at some of the rides that will be included in the expansion? Let's hope so. Aside from some concept art that was released last year at D23(some of which you can see above) we know very little about "Star Wars Land", which is a title tentatively applied to the project by fans. The attraction is said to be a fully immersive Star Wars experience, transporting visitors to a new planet in the Galaxy far, far away that's filled with various characters and a real Cantina. It will certainly be interesting to see what surprises Disney will have for us on February 21st.